Preventing a fatal car accident in the first place is a lot better than being in one. Auto accident victims face the possibility of serious injury, permanent disability, and disfigurement, as well as tremendous financial and emotional strain. Dealing with insurance companies and filling out mountains of paperwork is a hassle. Doing everything you can not to find yourself in this position just makes good sense. Keep your eyes and your focus are on the road. Do not talk on the cell phone (even if you have a hands-free device), do not text, do not shave, and do not apply makeup while driving. Your hands need to be firmly planted on the wheel, and your attention must be on the road at all times. You must be able to take evasive action as the need arises, or you might wind up being the one to cause the wreck! Before you drive, perform a simple safety check on your vehicle. Turn on the lights and walk around the car to ensure that all lights the bulbs are indeed burning. Test your blinkers, look for any telltale fluid leaks, and make sure your tires are properly inflated. A majority of car accidents happen at intersections. When stopped, for either a sign or a light, take the time to spell S-T-O-P before proceeding into the intersection. That slight delay should give you enough to time to spot any problems before you move on. Pay strict attention to the other vehicles in the intersection. Just assume someone is going to run the sign or the light, and prepare accordingly. Never drink and drive. Read all the instructions and warnings that accompany any medications you are taking, whether they be prescriptions or over-the-counter drugs. If the medicine warns of drowsiness, do not drive. Always use your seatbelt. Never start your car without getting buckled up first. 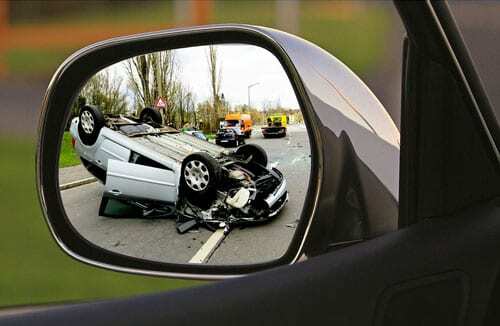 Keep your eyes moving, Always notice what is happening on the sides of the roadway and check behind you through your rear- and side-view mirrors every 6 to 8 seconds. When traveling behind other vehicles, you should leave at least a four-second space between you and the car ahead. Be extra careful in inclement weather such as rain or snow. Slow down in such situations. In severe weather conditions, avoid driving if at all possible. Avoid “blind spots,” especially with large vehicles such as trucks or buses. Remember, if you cannot see the driver’s rear-view mirrors, they can’t see you. Also be aware of the fact that “big rigs” have a very wide turning radius and so make “big” right turns. If you have been seriously injured in a car accident that was not your fault, please contact the skilled and knowledgeable attorneys at The Bernard Law Group for a free and comprehensive consultation. IF YOU, OR A LOVED ONE, HAVE BEEN SERIOUSLY INJURED IN A CAR ACCIDENT IN WASHINGTON – CALL TODAY FOR A FREE CONSULTATION! We were stopped at a red light, and a gentlemen came off and hit us. I had back surgery in January of 2008 and that alone was a hundred and seven thousand dollars. Bernard Law Group was there with me every step of the way. I feel like The Bernard Law Group helped us fantastically.